Profiles of Boston qualifiers | Run. Work. Live. Repeat. 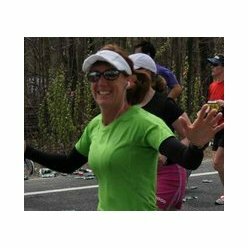 This Boston or Botox post jumps “the big pond” — the Atlantic Ocean — to take us to Copenhagen, Denmark, and Boston Marathon qualifier Kim Royle. Kim, 42, is a military wife who for now lives in Copenhagen with her husband and two children. Kim and I met digitally on the Dailymile.com. She is living proof that military wives are often as Hummer-resilient as their spouses. Kim comes from a fit gene pool. Her father has completed 19 Ironman events, a sponsor for Boston. Her dad got Kim her first entry into the Boston last year. 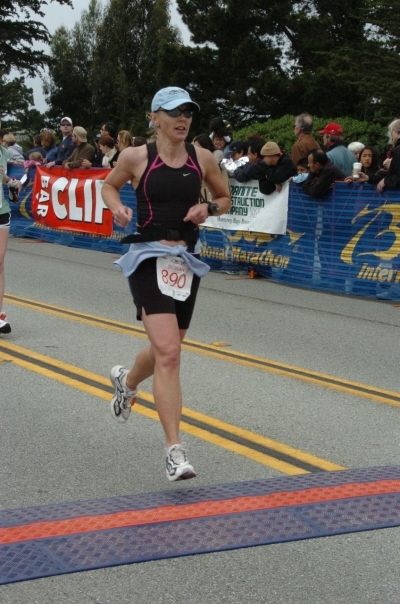 Then at Boston, Kim qualified with a time of 3:49:48. Kim will fly over from Europe next month to run Boston again and hopes to do even better. Due to our long-distance, online interview, Kim’s profile will be a slight departure from Boston or Botox style presented in Q&A format (with editing for length and clarity). Kim, for example, did most of her training for her first marathon on a treadmill in her garage at night while her husband was deployed away from home — true spirit of a Ninja Mutant Runnergirl. Boston or Botox: Where are you from originally and how did you come to live in Copenhagen? I am not really from anywhere as I was an army brat. I went to high school,college and got my first job in North Carolina so I sort of call that home now. My husband is currently stationed here working with the Danish military. I have been married for 11 years. My daughter, Maggie, is 6, and my son, Casey, is 4. I am not currently working (for pay) here in Denmark. I volunteer at my daughter’s school library. I have an MLIS from the University of South Carolina, Columbia, and an MA in Middle Grades Reading, but working as a expat in Denmark can be tricky. When did you start running? What got you motivated? In high school, my cheerleading coach required us to run cross country. I am not sure if that hurt or helped inspire me as I did not run for awhile after high school. I tried to run here and there throughout my life, but nothing too consistent until I thought about doing a marathon. Unfortunately, thinking about and actually doing it are two entirely different things. I finally made a goal with myself when my husband deployed for a year. Luckily, he ended up only being gone 10 months … but still it was 10 months. With him gone, I took to running on the treadmill in my garage at night once the kids were in bed. I really did not have anything else to do from 7 p.m. on and felt like I finally wanted to pursue that marathon goal, so I brought the baby monitor to the garage and did most of my training there. Plus, I wanted the last five pounds gone and what better way to do it? I also had a single and double jogger. Those were the best baby shower gifts ever. I put some heavy miles on them. Also, my father, brother and sister had all completed marathons. Originally, when I was living in Hawaii (many years ago), I decided that I wanted to do the Honolulu Marathon. I started to become a more serious runner at that time and I actually completed distances of 10-13 miles. At the same time my husband and I wanted to start a family. When we did get pregnant, I knew that the marathon was placed on the back burner, and that was fine with me. I have run two marathons … Kiawah Island in South Carolina was my first one. There are not a lot of spectators as it’s on a golf/beach community and in December, but it was a good experience. Several gals from my neighborhood community all got together and ran it. Boston was my second. I was a ‘special’ entry as I did not qualify at Kiawah. In fact, I did not even know what the qualifying time was. I was not in that mindset yet. When I finished (at Kiawah) someone said to me that I may have qualified for Boston. I did not. I missed it by three minutes. With my father’s Ironman and business connections he could gain me entry into Boston. He sent me an email and asked if I wanted to do Boston, and I said, yes. This time, I knew the time to qualify, but I really did not give it a lot of thought. I wanted to finish (Boston 2010) in under 4 hours. When I was on mile 20 (at Boston), I started calculating time left/needed, etc., to qualify and I felt that I could do it if I paid attention to my pace. My last miles were definitely faster … I think maybe three of them were sub-eights. What were your impressions of running Boston the first time? How hard did you train? I loved the crowd support. I think that is what is the key to a great marathon. Training is a whole different aspect. For the first one (marathon), I trained a long time with a specific schedule (Hal Higdon’s novice). I pretty much stuck to it. For Boston, I did not know I was even running it until February. In fact, I did not get my registration until March. I counted the weeks I had left and pulled up Hal Higdon again on the internet. I decided I wanted to do the intermediate plan and improve my time. I did not stick as closely to this one, but still got in three 20-milers. I also did more shorter, fast runs. Don’t get me wrong. I had done some running. I did two half marathons and a 10-mile trail run and I had been keeping up the running. But knowing you are doing a marathon three months out does not leave a lot of time if you have not been consistently running. I remember telling my husband, even though I was not training for anything, that I wanted to do one 10-miler a week, so I was in shape when my dad asked about Boston. What made you want to qualify for Boston in the first place? I think that because there was that (qualifying) time dangling out there … I thought it would be neat to qualify for Boston at Boston. Originally, I just wanted to break 4 hours. Your husband was gone when you trained for and ran your first marathon and you trained on the treadmill. How did you that? Did others watch your children? When did you get the time and chance to run? I ran when I could while my husband was deployed. It’s very hard to find time for yourself when you have two small children and your husband is away. Deployments can cause stress in so many ways. I had a lot of family around me. Not many military wives have that support that I did. I have a hard time letting myself depend on anyone, so depending on someone during those long runs was unnerving. My mother-in-law was great for that. She always came on Sundays and let me do my long runs. I was rarely good for anything longer than 10 miles on the treadmill. Most of my training was done at night. I remember ‘DVRing’ things I wanted to watch but needed to be on the treadmill. Then at 9-10 p.m. I would watch something to unwind from the run. Running at night did not keep me from being able to fall asleep. I also did quite a bit (before it got cold) with the BabyJogger. I would use the single when my daughter was in preschool. When they were both small I ran with the double jogger. As they (the children) got heavier, I would find myself stopping a bit more (for being exhausted or to break up their spats). I also found that there was a lot of maintenance to make sure they could be preoccupied for longer periods of time. I knew just how many snacks/drinks and toys to bring. Ultimately, I could not go for more than an hour with them. Also, when my son got older, he loved for me to stop and pick up sticks for him to hold. He soon found putting them in the spokes was entertaining. More and more, the jogger was not a good training option. Recreational running was fine with the joggers, but if I needed a serious run, or it was raining, the treadmill became easier. What is it like running in Denmark? Have a you found a support group? How do you like running there? I like running here a lot. I have explored many streets through my running, but running in a city has its drawbacks. Stopping for stoplights or weaving around pedestrians can be a big hassle. There are a lot of parks and trails as well (shockingly a lot for a city). Plus, running the coastline (when the wind is not threatening to blow you to Sweden) is beautiful. There are some great places where the distances are already calculated well. One of my favorites is around a set of lakes. One store (Marathon Sport) has a map of the lakes on its exterior wall that shows the distance of each one. There are also some neat historical monuments and statues that you can run near. It makes for a nice view! I run on Sundays with a group called Sparta (Sparta.dk). They are doing marathon training and have pace groups set up. The first time I showed up expecting to jump right in with 8:15- to 8:30-milers. Boy, was I thrown … it was all in kilometers! So I was clueless and had to do some fast calculations on my latest 5K. It was a little weird because all of the conversations around me were in Danish, but most all the Danes are bilingual. I find that fascinating. Nothing keeps the Danes from being outside. We run in pouring rain, blizzards, icy roads, etc. It is pretty cold here, too. The other 6 days a week I have taken to the U.S. Embassy gym. You will run Boston 2011 with your dad and brother. Any special goals? My brother will probably smoke me, but he is a barefoot/minimalist runner. My dad does the Ironman races. He tries to pick exotic places to do them. … Canary Islands, Brazil, New Zealand, Australia, etc. I think the goal for us is just to spend some quality time together. Today is a rest day; Denver to Boston miles logged: 1383; Miles left to go: 387. The DailyMile.com is like Facebook tailored for runners. I discovered DM a few weeks ago and that’s also how I digitally met Melodie Pullen. Besides being a Boston qualifier, Pullen, who lives in Columbus, Ohio, is a DM dynamo and a motivational Energizer Bunny. Melodie has hundreds of DM friends from around the country and she’s a member of Team DailyMile (which apparently requires you to submit a video on yourself, is based on your online DM activity and stats, and requires a vote, too). When we spoke by phone the other day, Melodie, originally from Louisville, Kentucky, was equally gracious as she is photogenic. (Yes, that’s her pictured above.) After our interview she “introduced me” to her DM pals. Within a day I was flooded with friend requests (very cool). What’s also inspiring about this 35-year-old mother of three boys, ages 10, 9 and 5, is how she got started as a runner several years ago. “(Running) was the only way I could lose all the baby weight from my pregnancies,” she explained. It’s hard to believe Melodie was once overweight based on how svelte and fit she is now, but Melodie said that’s what happened after her children. Melodie began to run. Little by little, the weight came off; she got in better shape then before she had children; and she fell in love with running. By August 2009 she was hooked on running. That’s when she did her first half marathon and she finished strong. “I started looking at my times and the race-time predictors, and that’s what got me thinking about doing a marathon and hoping to qualify for Boston,” she said. She ran the Columbus Marathon, her first marathon, in 2010 and finished in 3:41:28. It wasn’t until after the race she realized she had qualified for Boston because she was bumping up into the next age-bracket for qualifying this year. She was thrilled. “It was a gift from God,” she said. “Really I look upon it and think it wasn’t me. It was a gift given to me,” she said of her Boston qualifying experience. She will run Boston for the first time next month. Melodie and her husband both work from home — she helps to manage rental properties and he works for Google. They both like to run, she said, although he’s a more casual runner. Her husband is very supportive of her running and Boston training. Melodie’s workouts require dedication and juggling schedules. She often gets up early to run before her boys are up and before she has to work. She’s been plagued by a nasty case of plantar fascitis and she’s had to see a podiatrist during her current marathon training. She’s also had to adjust to long runs in the colder weather and storms, which has been challenging. It’s been tough, she said, but she’s not letting it stop her. She is excited to see how Boston goes and hopes to run well. Mileage today: 9; Denver to Boston miles logged: 1,358; 412 miles left to go. When it comes to balancing acts, gymnasts and tight-rope walkers have nothing on busy mom Kristy Skidmore, who lives in the Denver area. Take my interview with her for this blog. She happened to be free when I called. “We better talk now because who knows when another time will come up,” she explained. Skidmore works in book keeping, has two children — a son, age 7, and a daughter, age 5, is married to a CPA, and runs a fall marathon each year. She’s run 13 marathons total, including Boston, which she did in 2002. That was before marriage and children. “Life happens and priorities do shift things,” she admitted. Like many women, especially mothers, Skidmore has found that time managment and juggling comes with the turf. “When I’m marathon training I will often hire a sitter to help my husband during the hours I’m gone. It just helps,” she said. During tax season when her husband’s accounting work is at its busiest, for example it is almost impossible for her to train for a marathons. He also works part time as a ski instructor and they ski a lot, too. Skidmore first qualified for Boston in 2001. She ran the Chicago Marathon with a time of 3 hours, 36 minutes, then ran Boston in 2002. Back then she was in her mid-30s and single. ‘It was different. I was able to train much harder, really get into sleeping right and eating right,” she said. Skidmore, who grew up in the Midwest, had been a runner for fitness for many years. Gradually she began doing races once she got out of college. She moved to Denver in 1999. She ran her first marathon, Chicago, with her older sister in 1996. Her sister’s husband also happens to be the race director for the Chicaco Marathon. After that she got hooked on running marathons, doing a couple each year until she got married and had her first child. That’s when she took a few years off. The year her second child was born she returned to running them again. That first marathon after her daughter was born was her toughest, she said, and she bonked. It took time to adjust to being less rested after children and the changes to her body but she did it and got strong again. For the last few years she’s run the Denver Rock N Roll Marathon each fall. The irony is, she’s come so close twice, literally within seconds of qualifying for Boston again. Her finishing time for Denver two years in a row has been 3 hours, 51 minutes. 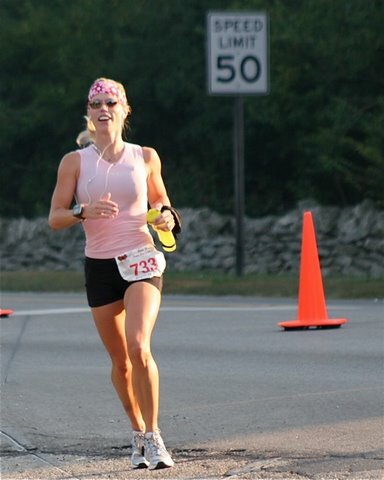 To qualify for her age group, women 40-44, she needs to run in 3 hours, 50 minutes, 59 seconds. I told her that she could possible still enter the race with that time and be accepted. A woman I met at the Portland Marathon in the same age group (which is mine, too) told me that the Boston Athletic Association allows an extra minute per year to your qualifying time the closer you get to the end of the age bracket. For example, a time of 3:53 minutes might be accepted for a 43-year-old woman. I don’t know if it’s true or not and have never found any information on the B.A.A. site to confirm it. You make the most of where you are in life, she said, and she won’t let it stop her. Her bucket list includes doing a marathon overseas, in Hawaii and maybe even the New York Marathon when her children are older and can enjoy the travel and experience, too. Mileage today: 9: Denver to Boston miles logged: 1258; Miles left to go: 512. For those of you who aspire to begin running but think you’re too old start, this profile is for you. Boston qualifier Ann Finley, who turns 58 this year, didn’t take up running until she was in her mid-40s. Finley always kept in shape by swimming, bicycling and playing tennis with her family. Back when she started, she lived in Salt Lake City, was working full time as a nurse, and was raising children. “I was lucky to live in a neighborhood back there we helped spot each other’s children and I had a great support system,” said Finley, a Minnesota native who went to nursing school in Utah and lived there afterwards. “I was able to make it a priority and make time to do it,” she added. Gradually she ran more and more. “I’ve never been one to really go out and formally train. I would just go out and run the trails for a couple of hours at time, a couple of times a week,” she said. She loved the solitude and strength she found in trail running. Eventually she took to road racing and marathons. Just a few years ago she set her sights on some bigger races and that’s when she clocked some impressive times in her age group. 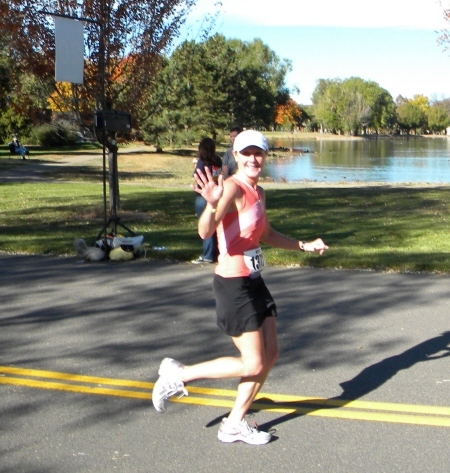 Her time at the Salt Lake City Half Marathon, at age 55 was 1 hour 38 minutes. 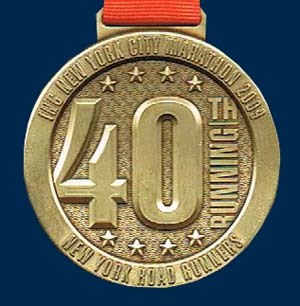 Finley then ran the New York City Marathon in 2009 (medal shown above) in 3 hours 54 minutes. That’s where she qualified to run the Boston Marathon, which she will do this year, in just a few months. Finley also has run the Pike’s Peak Marathon several times. She and her husband recently moved to Estes Park, Colorado, where she continues to live and train. She’s training for the Boston Marathon with a group of new friends she met after she moved to Colorado. There are several people from that group who are running Boston and they plan to meet up and celebrate after the race. “This is really the first time I’m formally training for a race, doing intervals each week, so we’ll see how that goes,” she said. Her hope is to run Boston in 3 hours 45 minutes. Finley said running the New York Marathon was a great experience and she’s looking forward to Boston. When Boston is over, she said she’ll head back to the trails where she hopes to keep going as long as she can, the rest of her life if possible. If anyone can do that, chances are good she’ll be the one. Roxane Geisler, second from the left in red jersey, pictured with members of the Highlands Ranch Running Club, a group she coaches and helped to start. 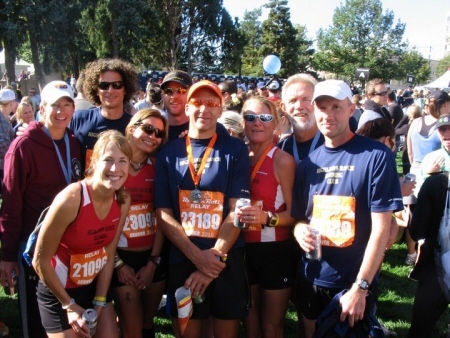 HRRC’s women’s and men’s teams won the relays at the Denver Rock N Roll Marathon 2010. Roxane Geisler at the Evergreen Town Race 5K, August 1, 2010. Roxane Geisler couldn’t be more in the trenches of a full life then where she is now. The mother of four boys, ages 15, 11, 6 and,2, she’s up daily from son up to son down. If it’s possible to diaper, and help with math homework, and run a household, and work, and run, she’s done it, although obviously not at the exact same time. One day last summer I ran into Roxane at one of our local pools. She bicycled there with one of her older sons and pulled her youngest son in an attached carrier. They were there for swim lessons for the older child. Even earlier that morning I saw her at the track. She zipped around in a flash as we did intervals with the “Quick Chicks,” a women’s group we both run speed workouts with year-round. Later that day she met up with the Highlands Ranch Running Club , a group she started a few years ago in our community, for another helping of track. Roxane, who’s a music teacher and whose husband writes arrangements for a publishing company, seems to draws stamina from her busy load. 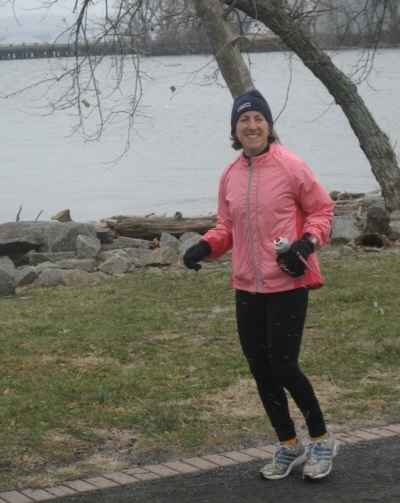 “I started running for stress relief and to enjoy creation. It brings me closer to my faith in God and I love being out on the beautiful trails in Colorado. I don’t know what I would do without it,” she explained. A native of northern Colorado, Roxane joined her high-school cross-country team after a friend asked to do it with her. She’d never participated in sports before then and struggled to complete the distances at first. Eventually she grew stronger and by senior year became captain of the team. In college at the University of Northern Colorado she met Doug Bell, owner of a local running store in Greeley. Bell encouraged her to join a group he organized. 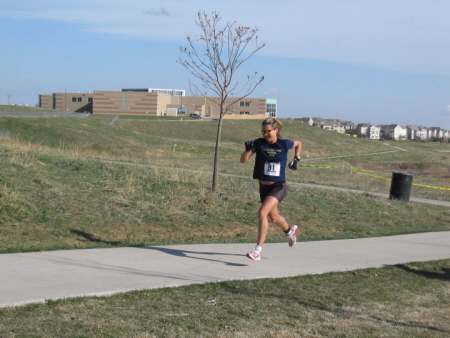 She began to run 5Ks and 10Ks regularly and participated in the Colorado Relay, a 100-mile race. It solidified her love of running. Roxane also met Dan, her husband, while at UNC. They both got their master’s degrees in music from the University of Miami. She ran her first marathon (3:43) in Miami, before they had children. She did it with minimal training, following a Galloway plan. Today Doug Bell remains a friend and mentor to her. A few years ago when she was asked to help form a new running community in Highlands Ranch, Colorado, where she lives, Roxane drew upon her experience from being in his group. At first it was often just Roxane and her husband and a few other participants at the group’s weekly runs. Today HRRC draws around 30 people and “feels like family,” she said. Roxane organizes the group with another local coach and friend, Phillip Buckley. They recently ran a men’s and women’s relay team in the Denver Rock N Roll Marathon and both teams won their divisions. The success of HRRC seems to reflect Roxane’s own full life, heart and spirit. A 5K racer with a 19:03 PR, Roxane always has positive, encouraging words for others at the track or at local races. Running 5Ks and 10Ks are her favorites, she admitted, but she hoped to run strong at the Colorado Marathon in Fort Collins, too. She wanted to run that particular race because the area brings back good memories of her parents and childhood. She managed a great finishing time, although she said she felt exhausted and dehydrated by mile 18 and was having tunnel vision. Luckily HRRC friends came to her aid and ran with her. “I don’t think there is anything like a ‘comfortable’ marathon,” she joked. She will not run Boston in 2011 given the craziness of the entries this year, but might try again to qualify and run it in the future. Her focus remains on HRRC and growing that community even more. Mileage today: 6; Denver to Boston miles logged: 839.5; Miles left to go: 930.5. Writer’s note: This profile is BostonorBotox.com’s 50th post and it’s also about my dear friend Pamela Monaghan-Geernaert. Without Pamela’s encouragement I might not have run a BQ, and this blog may never have existed so she’s sort of like BostonorBotox.com’s fairy blogmother. Pamela Monaghan-Geernaert is like the bionic woman of goal-setting. Few things keep her down and she’s always reaching higher, faster, stronger. Pamela is quite inspiring and doesn’t see herself that way. Pamela holds a Ph.D in medical sociology of gerontology from Case Western University and is married to another Ph.D. who is an expert in his field. She’s a certified personal trainer and aerobics instructor. 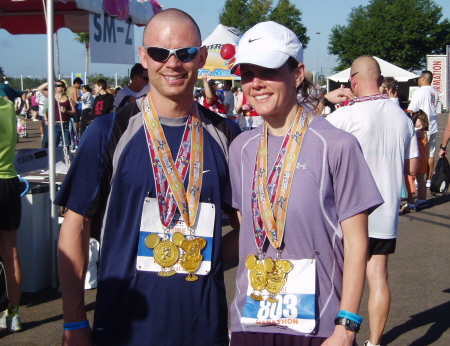 She ran the Boston Marathon in 2009 and will do it again in 2011 (with yours truly). She scrapbooks, knits, makes and sends out her own Christmas cards each year. She attends PTA meetings and volunteers at her daughter’s school. Pamela’s family recently moved from Santa Fe to Washington, D.C., and her latest project is their 100-year-old house, which needs some TLC. If anyone can make it sparkle again it will be Pamela. “My parents gave me the middle name Gay because they said I was such a happy baby,” she told me. That suits Pamela. She is equal parts exuberant and focused when you meet her. People who master a skill make it look easy when in fact mastery often takes years of hard work. That also is part of Pamela’s story. The youngest of four daughters, Pamela grew up in Calgary, Alberta, Canada. She dedicated years to her education, which she paid for herself and she became the first in her family to complete a Ph.D.
During her years as a starving student she became an aerobics instructor to help make money. She ran, too, just for fitness. She didn’t think of herself back then as a runner and she also had a horrible experience as a teen in high-school cross country. During her sophomore year a girl from an opposing high school team pushed her down while they were running in the middle of a race. Stunned and confused, Pamela hesitated before she got up. Her coach came over and yelled at her for not getting up sooner. Traumatized by what happened Pamela quit cross country. “I never understood what happened. I was a middle-of-the-pack runner, not someone who was going to win, and I thought the girl who did it was my friend,” she explained. Years later, she took up running again for fitness. Then a friend asked Pamela to do a marathon with her. Pamela’s father had died earlier that year. This time she found camaraderie, not competition, in a friend. The marathon took place on the first anniversary of her father’s death. Pamela’s mother met her at the 20-mile mark and at the end. It was moving experience for them both. “After training for that marathon it was the first time I saw myself as a runner,” she said. From that point forward running became a focal point in her life along side the other milestones. She celebrated her bacholerette party by running a half marathon in Las Vegas. She ran with her maid of honor the morning of her wedding. She ran a slow race a few days before her daughter was born. She ran with her daughter in a jogger until “she was clamoring to get out,” Pamela joked. She also ran a few more marathons in hopes of qualifying for Boston. Each time she set her expectations high she fell a little short. 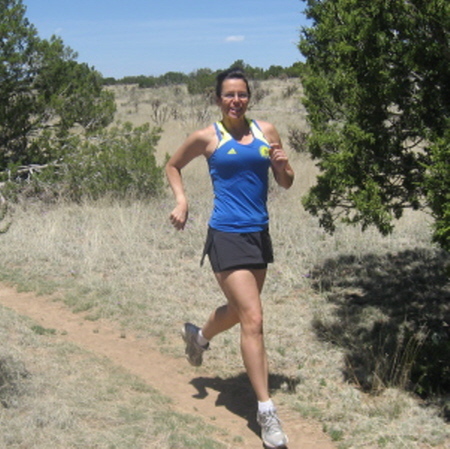 Finally in 2008 she trained for the New Mexico Marathon “on the fly,” no attachment to the outcome, and she qualified. It was liberating and exciting. She ran several marathons after that, including Boston, and got stronger and faster. Then she set her PR in 2009, the day of her birthday, surrounded by friends, love and support — miles and worlds away from that hurtful experience as a teenager. “Yes, I’m glad I’ve met my goals, but what I really enjoy is running with people and especially with my friends and being able to chat and connect,” she said. The bonding experiences are what she cherishes, Pamela stressed, and that’s where her goals and heart are today. Mileage yesterday: 5 and today: 5; Denver to Boston miles logged: 795; Miles left to go: 975.